We will focus on building the Infrastructure Division into a stable contributor to the Group. as compared to $2.0b for FY 2015.
as compared to $197m for FY 2015. Commenced the 10‑year operations and maintenance contract for Doha North Sewage Treatment Works. Secured six WTE technology and services contracts. Divested 90% of Keppel DC Singapore 3 to Keppel DC REIT. Acquired a stake in e‑commerce fulfilment company, Courex. Continue seeking out value‑enhancing projects, leveraging the Division’s project development, engineering, operations and maintenance expertise. Improve operational efficiencies by harnessing the strengths of an integrated gas and power business platform. Continue building up a portfolio of quality data centre assets and providing higher value services to customers. Grow e‑commerce and urban logistics capabilities to capture opportunities in Asia Pacific. The Infrastructure Division’s revenue of $1.7 billion was $293 million or 14% lower than 2015, mainly due to lower power and gas revenue from Keppel Infrastructure, as well as lower contributions from Keppel Logistics. The Division’s FY 2016 net profit of $99 million was $98 million or 50% lower than that of 2015, mainly due to the absence of gains from the divestment of a 51% stake in Keppel Merlimau Cogen Pte Ltd and the dilution re‑measurement of the combination of Crystal Trust and CitySpring Infrastructure Trust in 2015. This represents 13% of the Group’s net profit for FY 2016. Excluding revaluations, impairments and divestments, Keppel Infrastructure’s core operations remained robust, delivering a net profit of $84 million for FY 2016, $38 million or 83% higher than FY 2015 on the same basis. In 2016, Singapore’s average electricity demand grew at a year‑on‑year rate of 2.5%, outpacing the forecast Gross Domestic Product (GDP) growth of 1.8% and the 1.0% increase in average electricity demand in 2015. However, intense competition in the electricity market persisted as a result of increase in capacity and the number of independent electricity retailers. In the electricity market, the Energy Market Authority (EMA) implemented demand‑side bidding, which allows consumers to submit bids for the purpose of providing load curtailment. Keppel Infrastructure is preparing competitive products and services to be ready for the full liberalisation of Singapore’s electricity market expected in 2018. During the year, two new Liquefied Natural Gas (LNG) import licences were awarded, allowing licensees to bring in the next tranche of LNG imports. In addition, EMA has made plans to allow third‑party spot LNG imports and new piped natural gas imports on a case‑by‑case basis, and is also promoting the development of a Secondary Gas Trading Market in Singapore. As a gas importer, shipper, retailer and large user in Singapore, Keppel Infrastructure will continue to look for opportunities to improve its competitiveness in the Singapore energy market. Meanwhile, demand for district cooling services (DCS) has grown at a compounded annual growth rate of nearly 9% since 2010, fuelled by cost efficiency and government legislation on energy efficiency. In spite of challenging market conditions, Keppel Infrastructure’s integrated gas, power and utilities business delivered creditable results in 2016. Keppel Infrastructure now serves more than 7,000 customers in Singapore, underpinned by the active management and optimisation of its gas supplies and electricity sales portfolio. Keppel Infrastructure is actively collaborating with the other businesses in Group to create synergies, and is also looking into new and innovative ways to provide customers with competitive energy. In 2016, Keppel Infrastructure entered into an agreement with Keppel Land to supply renewable energy for the latter’s corporate office at Bugis Junction Towers, using photovoltaic panels installed on the former’s premises. Keppel DHCS has scaled up its DCS business through existing service corridors’ expansion and remains the largest DCS service provider in Singapore. To date, Keppel DHCS operates four plants in Singapore with an aggregate capacity of over 70,000 refrigeration tonnes in major business and industrial parks. During the year, Keppel DHCS commenced supplies for three new contracts. Keppel Infrastructure is poised to capture opportunities as the Singapore energy market continues to evolve. Since the commencement of long‑term LNG imports into Singapore in 2013, there has been an oversupply of generation capacity in the country. However, without any major planned power capacity coming into the market in the near future, and with the recent growth in electricity demand, the oversupply situation may alleviate in the coming years. EMA’s implementation of Full Retail Contestability, which is expected in the second half of 2018, will see more than 1.3 million households becoming contestable consumers with flexibility to purchase electricity directly from retailers, such as Keppel Electric, a wholly‑owned subsidiary of Keppel Infrastructure. This provides an opportunity for Keppel Infrastructure to grow its retail market base. Singapore’s evolving gas market presents fresh opportunities for Keppel Infrastructure, including a diversified selection of LNG and pipeline gas supplies. Keppel Infrastructure will capitalise on these sources of gas to provide customers with reliable and competitive gas supply. The demand for DCS in Singapore has remained strong. To seed the next phase of growth, Keppel DHCS is actively exploring opportunities with various government agencies and developers to incorporate DCS concepts into the master plans of upcoming major cluster developments in Singapore. Rapid global urbanisation and stricter environmental regulations will underpin the growth of the Environmental Infrastructure business. Tackling environmental issues has been identified as one of the main priorities of the Chinese government. As part of the 12th Five Year Plan, a target to treat up to 35% of the country’s municipal solid waste by incineration was established by the Chinese government. From 2011 to 2015, the progress of waste‑to‑energy (WTE) projects had been lower than the target. Arising from this shortfall of incineration capacity, near‑term opportunities are expected, with more than 200 WTE projects to be built in the coming years. The Chinese Government’s 13th Five Year Plan, which emphasises innovation and green development, is expected to spur international cooperation in technology and science. This will provide more opportunities for Keppel Seghers to leverage its WTE technology to build strategic, long‑term, local collaborations, and create deeper inroads into the environmental market in China and beyond. WTE has been gaining recognition in the Southeast Asia region as a competitive solution for municipal solid waste management, while producing renewable power. With a gradual but notable shift in regulations and policies in support of WTE solutions in markets such as Indonesia and Thailand, Keppel Seghers will ride on this development trend to capture opportunities in new markets. In Indonesia, the country is expected to see the development of over two million tonnes of WTE capacity from projects in Jakarta and surrounding areas. Meanwhile in Thailand, waste market reforms and feed‑in‑tariffs point to greater government support for the development of WTE projects. About 19 WTE projects have been planned or approved, and are expected to be commissioned between 2017 and 2025. Over in Europe, demand for WTE solutions remains opportunistic as countries such as Poland, Spain and Portugal continue with efforts to fulfill the European Union’s (EU) waste legislation. Keppel Seghers continues to take a selective approach in these target countries to build up its pipeline of projects. In December 2016, Keppel Infrastructure was named the preferred bidder by PUB, Singapore’s national water agency, to Design, Build, Own and Operate Singapore’s fourth desalination plant with a concession period of 25 years. The project will further grow Keppel Infrastructure’s business in the water sector, and will harness the strengths of the company’s integrated energy and water business to create value and support Singapore’s growth needs. 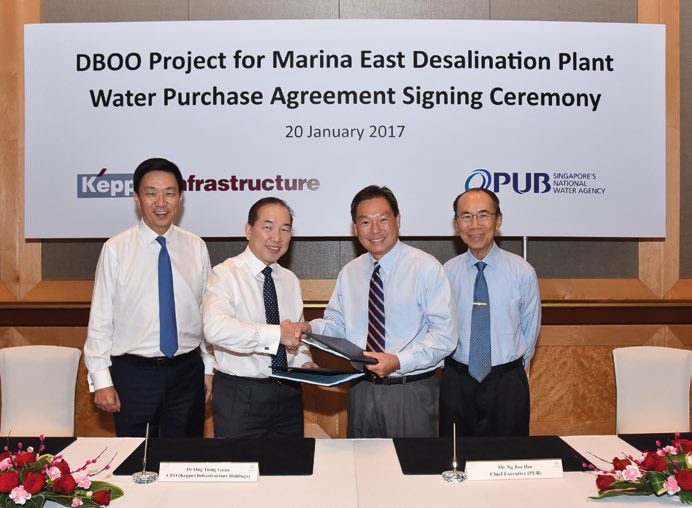 Subsequently, the Water Purchase Agreement (WPA) was signed between PUB and a wholly‑owned subsidiary of Keppel Infrastructure in January 2017. The 25-year WPA was signed by Dr Ong Tiong Guan (second from left), CEO of Keppel Infrastructure, and Mr Ng Joo Hee (second from right), Chief Executive of PUB, and witnessed by Mr Loh Chin Hua (extreme left), CEO of Keppel Corporation, and Mr Tan Gee Paw (extreme right), Chairman of PUB. In Qatar, Keppel Seghers handed over the solids stream and sludge treatment facilities in the Doha North Sewage Treatment Works to its client. With this, Keppel Infrastructure Services, a wholly‑owned subsidiary of Keppel Infrastructure, commenced its 10‑year operations and maintenance phase of the contract for the facilities, generating recurring income for the Group. In China, Keppel Seghers continues to build on its track record as a leader among imported WTE technology solutions providers in the country. During the year, Keppel Seghers secured six contracts to provide WTE technology and services, including two respectively for the Baoan WTE plant and the Nanshan II WTE plant. It is currently executing seven WTE technology packages for projects with a total incineration capacity of over 14,000 tonnes per day. All projects are progressing within their contractual schedules and budgets. In the water and wastewater sector, the Tianjin Eco‑City Reclamation Plant commenced commercial operations in August 2016. 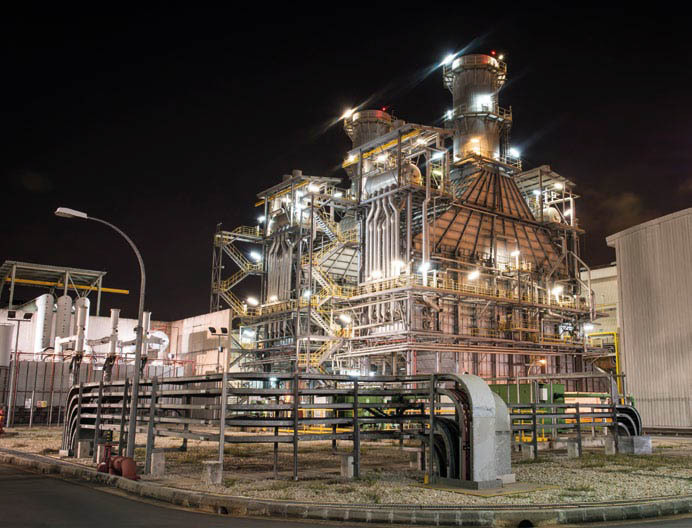 Keppel Seghers also completed the incineration capacity upgrade at the Senoko WTE plant in August 2016, ahead of schedule and within budget. Meanwhile, the capacity upgrade of the Keppel Seghers Ulu Pandan NEWater plant is on track to be completed by mid‑2017. Against the backdrop of rapid urbanisation, depleting landfill capacity and rising awareness of environmental and pollution issues, there is an increasing need for governments to look into sustainable waste management solutions. In China, driven by the government’s priority in tackling environmental issues, the country has targets set for both pollutant emission reduction and environment quality improvement in its 13th Five Year Plan. The focus on green development and innovation presents opportunities for Keppel Seghers to capture new WTE projects, as well as to deepen its footprint in China through strategic collaborations with local players. In Europe, the replacement and upgrading of ageing facilities and rapid development in new EU members will provide more prospects in this sector. Keppel Seghers will explore technological development opportunities to expand its WTE product offerings. Meanwhile, Keppel Infrastructure will continue to seek out value‑enhancing projects and strengthen its market position, leveraging its project development, engineering, operations and maintenance expertise. Global economic conditions remained challenging in 2016. In China, growth moderated to 6.7% in 2016 as the economy continued to rebalance towards domestic‑driven consumption and services. This transition predominantly impacted the manufacturing sector, which is shedding excess capacity while moving towards higher value‑added activities. Meanwhile, rising protectionistic sentiments in the US could affect emerging markets in Asia, which have historically been geared towards exports. The logistics industry has witnessed an increasing adoption of new technologies and business models. 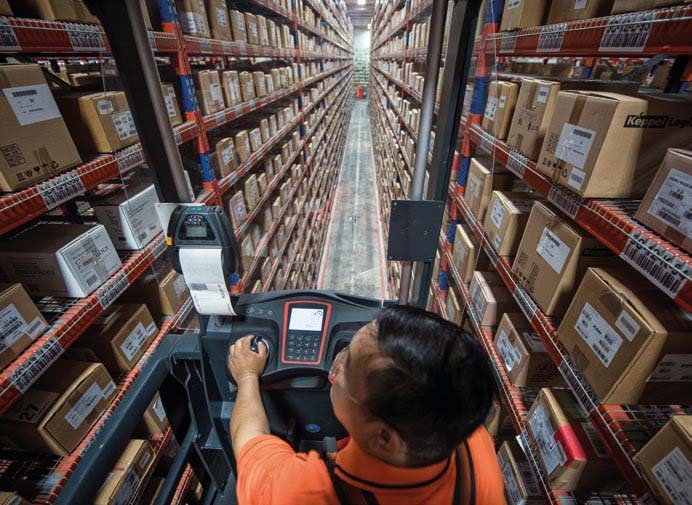 Demand for omni‑channel and urban logistics solutions are on the rise, while new business models such as crowdsourcing allow companies to scale up their operations with little asset investment. Keppel Logistics is fine‑tuning its strategy to adapt to the changing industry landscape with a focus on strengthening its core competencies, streamlining processes and resource allocation. In 2016, Keppel Logistics integrated its operations in Southeast Asia and China as part of its strategy to boost its offerings. Despite industry headwinds, Keppel T&T maintained good warehousing occupancy across its facilities. In Singapore, Keppel Logistics acquired a 59.6% stake in Courex, a Singapore e‑commerce fulfilment provider, as part of plans to gain a foothold in the e‑commerce space. Courex’s Business‑to‑Consumer logistics capabilities complement the company’s existing Business‑to‑Business offerings, allowing Keppel Logistics to provide comprehensive urban logistics and omni‑channel logistics solutions. During the year, Indo‑Trans Keppel Logistics completed a 47,800‑square feet (sf) expansion of the Hiep Phuoc warehouse in Ho Chi Minh City, Vietnam, which has been fully taken up by a key customer. Keppel Logistics will continue to leverage technology to deliver quality urban logistics services to its customers. Meanwhile in China, the Tianjin Eco‑City Distribution Centre commenced operations in September 2016, servicing customers in the food processing and trading businesses. In addition, the Keppel Wanjiang International Coldchain Logistics Park in Anhui Province will add more than 506,000 sf of shopfront space, as well as about 518,000 sf of coldroom and ambient warehouse space to Keppel Logistics’ operations in China when completed. Despite slower growth in China’s domestic economy, Keppel T&T’s Lanshi Port in Foshan, Guangdong Province, maintained its throughput, while Foshan Sanshui Port’s throughput continued to grow, driven by its favourable location and operational efficiency. The Wuhu Sanshan Port, located in Wuhu, Anhui Province, achieved a stable throughput volume of 4.06 million tonnes amidst a slowdown in the area’s manufacturing activities. The market outlook for trade, consumption and investment in China and Southeast Asia remains cautious. Nevertheless, a shift towards domestic consumption and intra‑region trade will continue to drive growth in import‑led logistics services in the region. Keppel Logistics will continue to focus on delivering quality logistics services in these targeted markets and transform its business model to capture new growth in e‑commerce, omni‑channel and urban logistics. Keppel Logistics will also seek to improve cost efficiencies and explore opportunities to recycle capital. The data centre market experienced strong growth in 2016, underpinned by the rise in cloud computing, big data analytics and digitalisation. The adoption of data centre colocation has also been on the rise, as it offers enterprises the benefit of seamless expansion with minimal upfront costs. Furthermore, in tandem with growing data sovereignty trends is the need for businesses to store data locally and for colocation service providers with a presence in the host country. The operation of data centres requires large amounts of energy. With increasing focus on environmental protection, big cloud service providers have announced plans for carbon‑neutral and innovative energy‑efficiency features in the design and construction of data centres. Capitalising on the positive market trends, Keppel Data Centres Holding (KDCH) has expanded its footprint beyond its current geographies. Together with its associated company Keppel DC REIT, KDCH has a total of 17 facilities spanning nine countries and over 1.4 million sf of net lettable area. Its growth plan is supported by strong capabilities in developing and operating data centres, a commitment to high efficiency and environmental consciousness, as well as a dynamic capital‑recycling platform through Keppel Capital and Keppel DC REIT. Having achieved full commitment at Keppel DC Singapore 3 since April 2016, KDCH divested 90% of its shares in the asset to Keppel DC REIT, at an agreed value of approximately $202.5 million. Also during the year, Keppel T&T divested 50% of its shares in Keppel DC REIT Management to Keppel Capital, as part of the Group’s restructuring of its asset management businesses. In early‑2016, KDCH commenced construction of Keppel DC Singapore 4, which is expected to achieve its Temporary Occupation Permit and complete first phase fit‑out in the first half of 2017. Upon completion, Keppel DC Singapore 4 will have about 183,000 sf of Gross Floor Area (GFA) pre‑committed. Keppel’s senior management broke ground for Keppel DC Singapore 4 (formerly known as Keppel Datahub 3), expanding our data centre footprint in Singapore. In April 2016, KDCH signed a collaboration agreement with PCCW Global to co‑develop an international carrier exchange in Hong Kong, offering connectivity‑related managed services to facilitate interconnects. Upon completion in 2017, the international carrier exchange will feature high‑quality Tier III telecommunications centre space. During the year, KDCH collaborated with Alpha Investment Partners (Alpha) to launch the US$500 million Alpha Data Centre Fund (Alpha DC Fund). The Alpha DC Fund aims to secure a portfolio of quality assets across key data centre hubs in Asia‑Pacific and Europe. 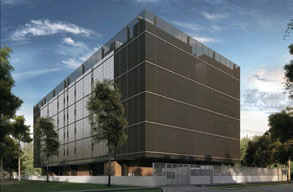 When fully‑invested, the Alpha DC Fund is expected to fund up to about US$1.0 billion worth of data centre projects. Through its collaboration with Alpha, KDCH expanded its colocation footprint with the acquisition of Keppel DC Frankfurt 1 in Germany. The data centre, which is currently leased to a leading global financial institution, features over 215,000 sf of GFA and is fitted to Tier III‑equivalent specifications. In 2016, KDCH expanded its capabilities with several strategic partnerships to provide value‑added services for its customers. These partnerships included a Memorandum of Understanding with the National Supercomputing Centre Singapore to explore supercomputing and high‑performance computing, as well as a partnership with Quann, a Certis CISCO unit specialising in managed security services, to provide end‑to‑end enterprise cyber security solutions. With increasing data centre outsourcing, the global colocation market is expected to grow at a compounded annual growth rate of 12.8% from 2016 to 2022, reaching a size of almost US$67 billion by 2022. Keppel T&T will continue to expand beyond its existing geographies and capture opportunities to provide extended services, leveraging the Alpha DC Fund and Keppel DC REIT.